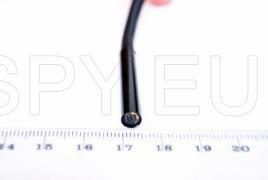 The length of 20 meters of this endoscope allows for inspection of pipes and other inaccessible places at a great distance. Plug it in the USB port of your computer and watch the video on the screen with a resolution of 640x480 pixels. For poorly lit environments the camera is equipped with LEDs with adjustable light intensity. - Diameter of the camera - 15 mm. With this 15 meters waterproof endoscope you can inspect inaccessible and poorly lit areas, record video and also it makes it easy taking pictures thanks to the built-in program. It can select among several resolutions for photos and videos also you can adjust the white balance. For even greater convenience there are three auxiliary tips. The 2 megapixel camera with CMOS sensor will allow you to see the object of interest in greater detail. 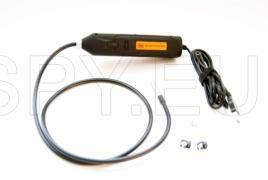 For providing a clear image it has six LEDs whose light can be adjusted smoothly using the handle. 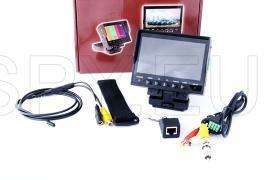 In the kit there is easy to use software that does not require installation. 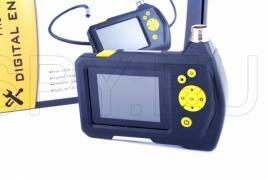 With its help, you can take pictures or you can record videos from your inspection. You can select between three resolutions - 640x480 , or 1280x720 1024x786. 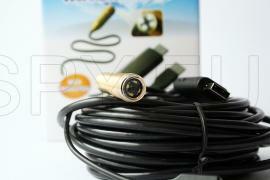 With this endoscope, you can immediately see the picture from the inspection sites. The color 2.4 inch display will provide a clear picture that you can rotate 360 degrees and adjust its contrast. The camera has a 10mm diameter and is equipped with adjustable white LED light. 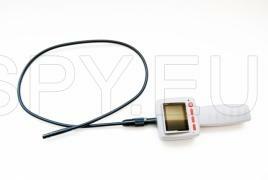 The operating length of the endoscope is 88cm and the total (with the handle) is 117cm. Powered by four 1.5V AA batteries. The weight of this product is just 325g. 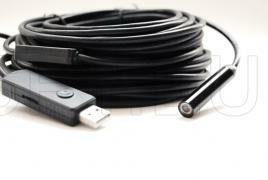 This is a waterproof endoscope with a very small diameter. The camera has a size of only 5.5 mm, but allows you to get an image with a resolution of 1.3 MP. To get images in the dark there are also 6 bright LEDs, their light can be adjusted smoothly. The angle of vision is 60 degrees and the minimum focus distance is 3 cm. The cable length is 5 meters. With the included software on a disc you can watch and record pictures on your computer in 1280x1024, 1280x720, 800x600, 640x480 or 352x288 and the video is 640x480 pixels.